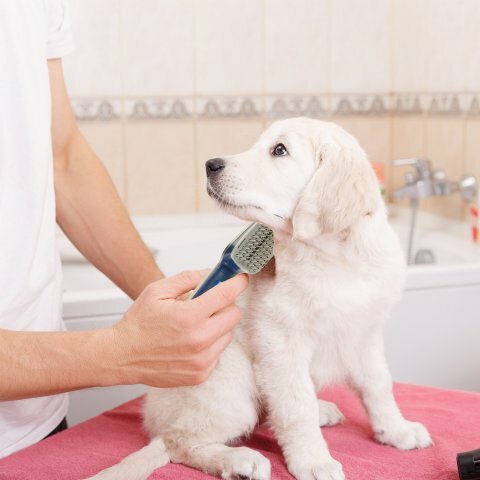 While pet salons and hotels offer up a variety of pet spa services for a pretty penny, you could give your dog a relaxing spa day yourself that is equally as fancy in the comfort of your own home. This special DIY Pet Spa Day feature is going to be a two article series so make sure to come back for part two where I'll be covering paw massages and doggy pedicures. First, let's take a look at some of the best selling pet spa products that you can use to primp your pup and then I'll show you how to put it all together to create an amazing at home spa day for your fur baby. Brighten your dog's fur and get rid of tear stains with South Bark's Blueberry Facial (yes, it's really blue). 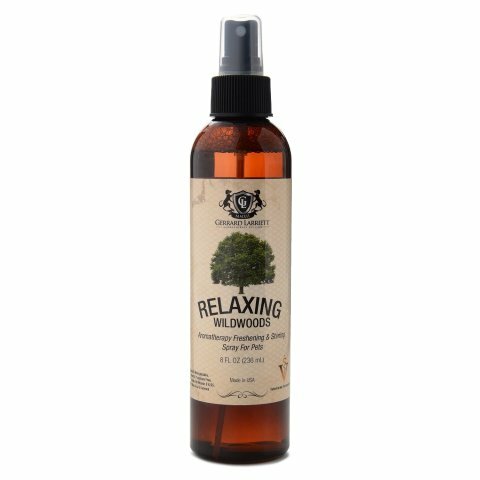 An this Aromatherapy Freshening and Shining Spray by Gerrard Larriett smells great and adds some shine to your dog's coat. 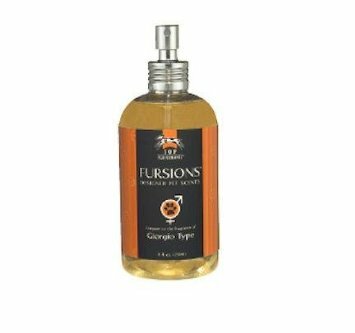 Get your pooch feeling dapper with some Top Performance Fursions Dog Cologne. Don't ignore those ears. 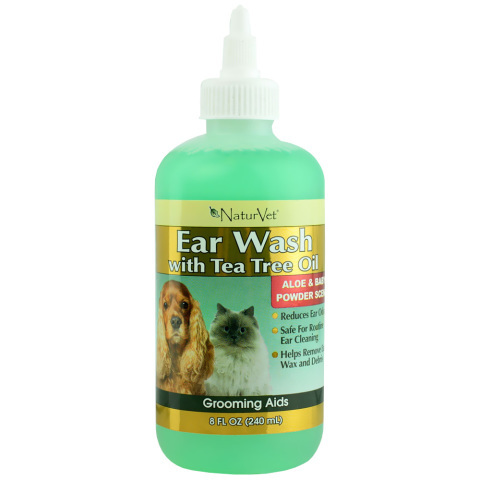 Get them squeaky clean with NaturVet Ear Wash with tea tree oil. Don't get caught with doggy breath. 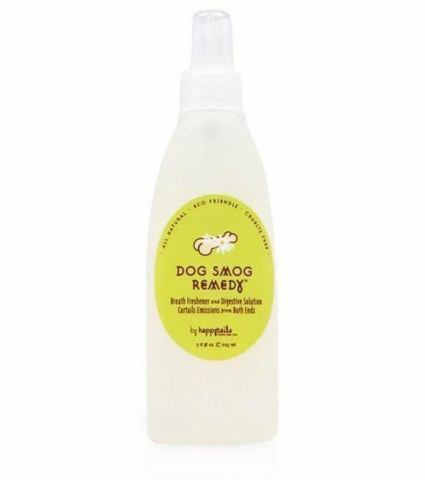 Freshen up with Happy Tails Dog Smog Remedy. This Animal Heaven Ionizing Brush reduces static and also gets rid of bad smells that can build in your dog's fur. 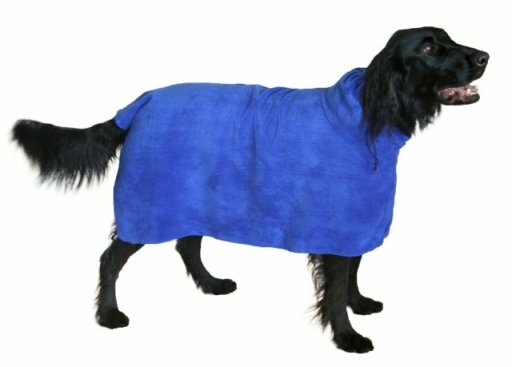 Get snuggly with a Snuggly Dog Microfiber Bath Towel that absorbs more water than a reglar towel and also wears like a robe. Have a jittery dog? 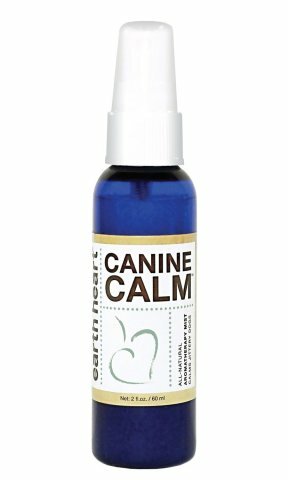 Get them to relax with Earth Heart Canine Calm Aromatherapy Spray. You're probably ooh'ing and ahh'ing over that blueberry facial while simultaneously wondering why I've included things like breath and ear spray, am I right? Well, after researching what's included in facials at trendy professional pet spas and hotels, I found that almost all of them include breath freshening and ear cleaning because, well, why not? And now, the part you've been waiting for, how to give the ultimate At-Home Doggy Facial. 1. You're going to need to wet your dog's face before applying the blueberry facial and then rinse it off so it would be best to do this in the bathtub or if you have a small breed, the sink if you wish. 2. 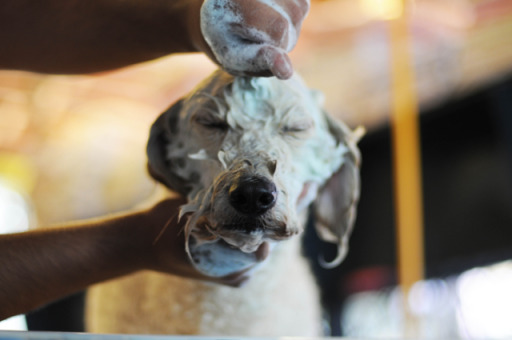 Most dogs aren't too keen on getting a bath, so why not calm them with a little aromatherapy spray followed by a quick 5-10 minute head and face massage first? Dogs benefit from massage just like humans do. To give a relaxing dog head and face massage, start by petting your dog's head and neck using long, continuous strokes. This will calm their nerves and get them used to your hands being on and around their face which can make some dogs skittish. Once they've calmed down, you can begin to use a sort of gentle pulling motion on the top of their head using the fingers of one hand, think of this motion like one of those wire head massagers you've seen. Now you can work on the ears. Gently cup the base of each ear in your hands. Using your thumbs, gently massage the area where the ear meets the head using circular motions. Now, gently rub your dog's ears between your thumb, forefinger and middle finger. Run your hand over the entire ear and then pull very, very gently on your dog's ears for 1-2 seconds. Moving downwards, use each of your thumbs to make tiny circular movements on your dog's brow working from the middle of the face outwards. Bring your thumbs back to the center and firmly smooth them over the brows, again, moving outwards. Once you're at the sides of your dog's head, use your forefinger and middle finger to make circular movements at your dog's temples. Lightly rub the length of your dog's snout with your thumb. Work from the top of the nose up to the top of the head. Using both thumbs, make small circular movements over both of your dog's cheekbones simultaneously. Follow your dog's cheeks from the nose, all the way up to just below the outer corner of their eyes. Be sure to use light pressure. Going back to either side of the nose and following the cheeks out, smooth your thumbs outward. Finish the massage off with more long, continuous pets all over the head, neck, and face. Throw in some ear scratches for good measure. Now, using both hands, gently place your hands over your dog's face and using firm pressure, slowly begin to smooth your hands up and out from the snout all the way to just behind the ears. This makes a nice, gentle face stretch. Now you're done! Although Fido may beg you for more. 3. Now that your pooch is nice and relaxed, begin to wet their face with lukewarm water using a soft washcloth. You don't need to over saturate their face, just dampen it. Using either the washcloth or your hand, begin to apply the blueberry facial. Once applied, begin massaging it into the fur. Now, let the product sit for 1-2 minutes (if your pup will allow) and then wash it off. 4. If you wish, you can take your doggie out of the bathtub so that they're more comfortable. To really give that spa feel, you can wrap your fur baby up in one of these ridiculously comfortable looking towels or robes. 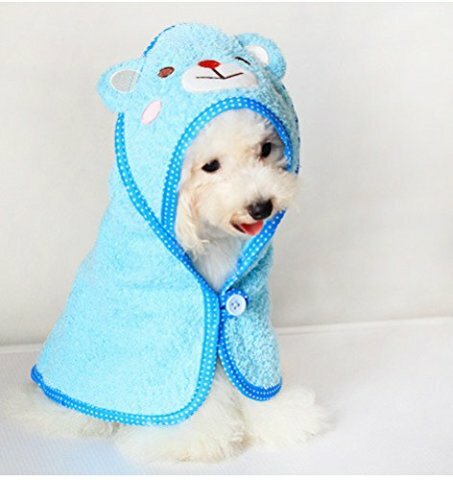 Yes, there are bath robes for dogs and it creates some cuteness overload. 5. It's time to freshen up that dog breath. Use an oral care spray for dogs, simply follow the directions on the bottle. 6. Let's clean those ears. Using a spray or some cleaning wipes made for dogs, again, follow the directions on the package and get those adorable ears squeaky clean. 7. To finish off this amazing doggie massage and facial, brush out that nice, clean fur. Wanna take it a step further? Add some shine to your pup's coat with some aromatherapy spray or if you're feeling particularly fancy, some cologne. 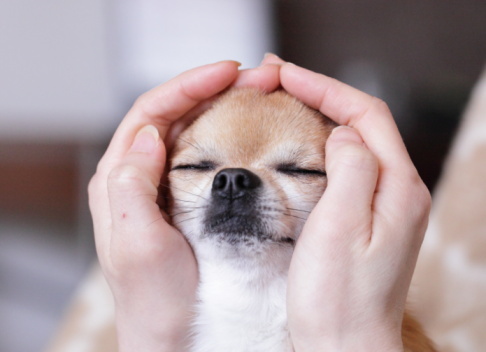 Now that you know how easy it is to give your dog the pampering he deserves with a DIY Home Dog Facial Massage, will you be willing to try it out? Check in at PetsLady frequently as I cover more lavish ways to spoil your four legged friends. Show us some love by commenting, sharing, and liking us on Facebook and Twitter. Sources: All Pet Naturals, Pedigree.